Toronto is my hometown and where my foodie roots really began. Back when I was in my very early twenties and living in downtown Toronto (oh, the life! ), I began to discover the amazing quality and variety of good eats that my city had to offer. I was growing tired of the same old thing I would be eating on the weekends when I went back home to the suburbs, so eventually I started a new plan: Every week, I would pick a restaurant from Toronto.com's list of top restaurants and convince my parents and siblings to come down to the city and join me on my dining explorations. I haven't had a Toronto postal code for a number of years now, but I'm typically here 2-3 times a year, and every trip typically causes some inevitable weight gain as they all involve a significant amount of consuming really good food. :) Being an extremely multicultural city (there are over 100 native languages spoken here! ), Toronto boasts some amazing ethnic food selections, and for someone like me who loves to try new foods, I always make sure that I'm taking advantage of all the culinary opportunities whenever I'm in town. My current trip so far has been no exception, and my dining adventures in good old T.O. (nickname that stands for for Toronto, Ontario) will be featured in my next few posts. I arrived Monday afternoon and made my first stop at my brother's bachelor pad in the heart of the Entertainment District in downtown Toronto. (Jealous!!) 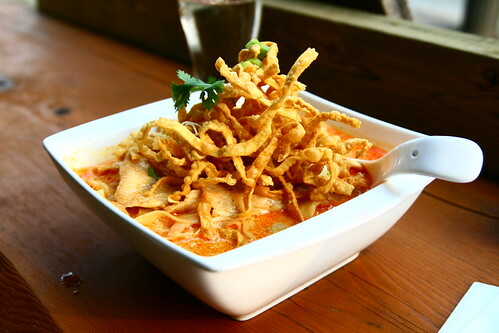 For dinner, we decided to check out Khao San Road, which features authentic, mostly Northern Thai cuisine. It had been on my wish list and happens to be just a short walk from Lil Bro's place. Khao San Road had just opened on Adelaide Street a few months ago, but the owners are seasoned restauranteurs as they also own Sukhothai which is apparently considered the best Thai in the city. (Note to self: File this under "must try"!) 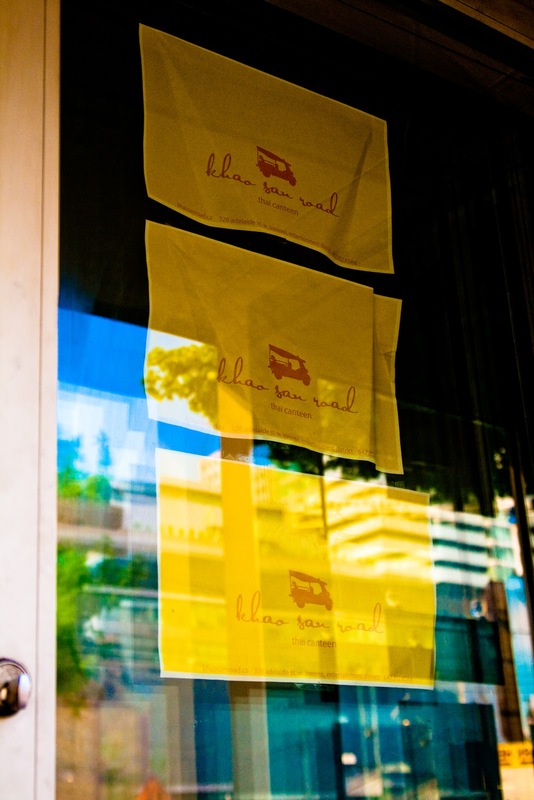 According to Lil Bro who spent four months in Thailand last year, "Khao San Road" is the name of a bustling tourist attraction in Bangkok, so it seems a bit surprising that Khao San Road, the restaurant, portrays such an unassuming and low-key image. In fact, we almost walked right past the restaurant as there was no big sign above the entrance featuring the restaurant's name. Good thing I had memorized the address! 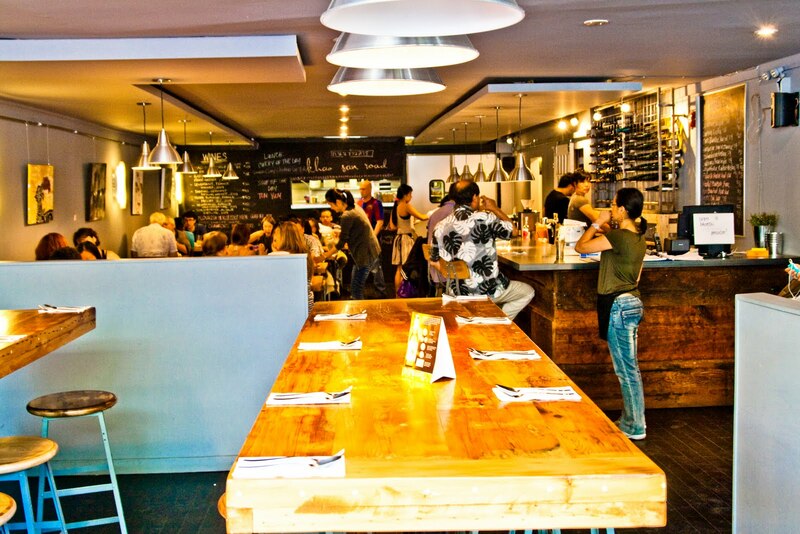 The decor of the restaurant's interior is pretty modern yet casual. The space isn't huge, and the tables in the back of the restaurants were all filled by the time we got there at around 6:15 pm, and the larger tables by the front had been reserved for a large party. Clearly a good sign for a Monday night. :) If the condo boom that's been going strong in downtown Toronto for the past decade is any indication - and there are several new luxury condo highrises currently being constructed right in the Entertainment District - I predict Khao San Road will be getting a lot more packed in the near future. Lil Bro and I sat at the "patio" seats which is basically a long bar table with five chairs at the very front of the restaurant and literally looking out to the street as pedestrians stroll by. I preferred the natural lighting out there anyway, so it worked out well for us. The view from our seats, the tip of the CN Tower in the background. 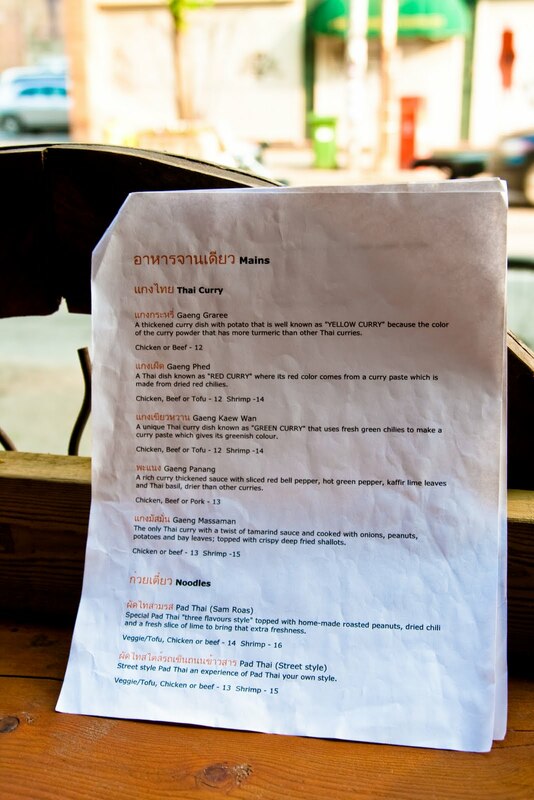 Khao San Road's four-page menu is printed on regular paper and stapled together. I'm not quite sure if it was to fit in to the casual theme, or because the owners are waiting to finalize the menu before printing permanent ones, or a combination of both. Daily specials are scrawled on the chalk board in the back of the restaurant. While the menu isn't extensive, Chef Nuit does a marvelous job with what is on the menu. Lil Bro and I decided to each pick an entree but to share a few bites with each other. 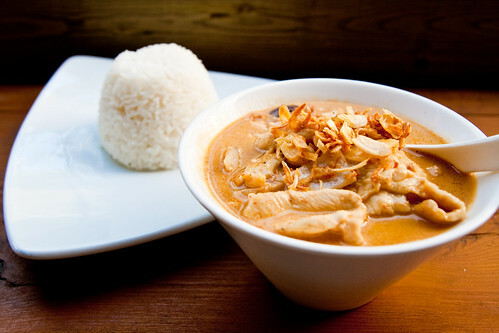 I selected the Gaeng Massaman or Massaman Curry, with chicken. It was a slightly risky choice, as I have not always like the Massaman Curry I have had at other Thai restaurants. As a peanut based curry, some restaurants tend to overdo it with the peanuts, tipping the balance of the curry far too much towards the peanutty and salty side. But not so at Khao San Road - the flavor is light and even a little sweet. I'd even venture to say that this was by far the best Massaman Curry I've ever had. topped with crispy deep fried shallots. Lil Bro ordered the Khao Soi, which was a coconut-based curry with egg noodles, topped with crispy noodles, green onion, and lime. We were both impressed with this dish as well. It was a bit spicier than the Gaeng Massaman even though we had both ordered our curries medium, but we didn't mind it at all. Just like the Gaeng Massaman, this dish was phenomenal. Finally, despite being pretty full, I couldn't resist dessert. 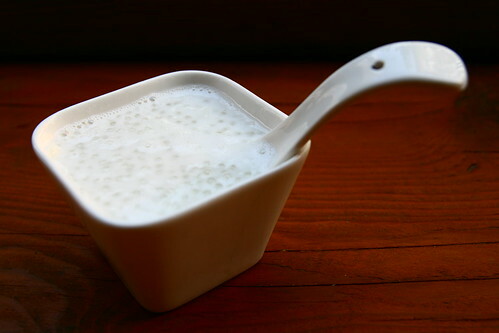 Khao San Road only serves one dessert as of this writing, and it consists of a little bowl of tapioca pearls and coconut strips in cool sweet coconut milk. This was very tasty as well and highly recommended.